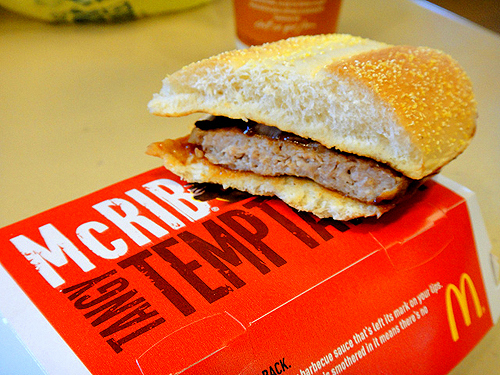 The McDonald’s McRib sandwich. That was it. Period. End of sentence. But in the past several months, McDonald’s cult-classic sandwich has a lot of company. Wendy’s, Burger King, Pizza Hut and Carl’s Jr. are just some of the chains that have offered barbecue-based products on their menus, sometimes also launching major ad campaigns to promote the product. The reason for this increase in barbecue popularity is a familiar one: Millennials. It’s yet another way the fast food industry is attempting to tap into this market base. Millenials are known for preferring sweet, smoky and hot flavors, making barbecue a no-brainer choice to lure these customers. That’s why Carl’s Jr. and Hardee’s recently offered a burger topped with smoked beef brisket and spicy mesquite BBQ sauce. And why Burger King currently offers a burger topped with barbecue sauce and onion rings on its 2-for-$5 menu. It’s also why Pizza Hut launched an ad campaign earlier this year featuring country music singer Blake Shelton hawking its new line of BBQ pizzas. And why Wendy’s contracted actors Ralph Macchio, Alfonso Ribeiro, and former professional wrestler Steve Austin to talk about “barbecue inaccessibility” for Wendy’s “#BBQ4America” campaign, featuring a line of limited-time barbecue items. But by now, a clear pattern has formed. If millennials tend to like something, the fast food industry will jump all over it. Barbecue is no exception. It’s uncertain whether any of these limited-time items will catch on permanently, but expect more barbecue options to come down the pipeline as the industry tries to drum up more business. Nevin Barich is the Food & Beverage analyst for Industry Intelligence, a Los Angeles-based market intelligence firm. It's the perfect job for him: He loves junk food, he often works besides a glass of Diet Dr. Pepper, and anytime one of the health nuts in his office gives him grief for eating a Big Mac, he gets to smile and say: "Hey, this is my job." Email him at [email protected] or follow him on Twitter.